When I was a kid I used to love to pick a dead dandelion and blow the little white seeds into the air. When my kids were little we would do the same. I can remember sitting on the ground and plucking them one by one with Kiersten and Morgan and blowing the dandelion dust gently into the wind. Sometimes we would stand and hold the delicate flower in our hand, arms straight out, and we would twirl around real fast causing the wind to blow the seeds leaving us with just a bald-headed stem. As the years went by we didn’t really look at those dandelions as something fun and freeing but rather as an annoying little yellow bud that grew to take away the “manicured yard” look. We began looking at the dandelion dust stems as success that the pesky plant was dying out. We certainly didn’t want to spread the seed by blowing on them. As I was walking yesterday and saw many dandelion dust stems, I remembered those days and the fun we had with a simple act. I thought of them as kindness seeds and spreading joy around our little world just by taking a few minutes to breathe on the plant. If we would just take a minute each day to show kindness to someone we could spread that joy all over our community, just like when we blew on the dandelion dust. Just like dandelions, we should be beautiful bundles of yellow cheer that keep plopping up everywhere even when others try to rid the world of our kindness. We should keep spreading those seeds of kindness and bring some cheer into everyone we come in contact with. 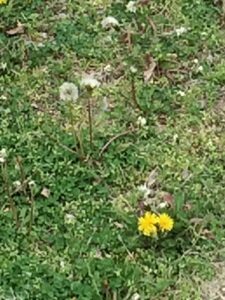 Today as you float about your day, notice the dandelions and look at them as a cheery plant created by God to spread a little color and joy to this dark world. Find your inner-child and pick up a stem with some dandelion dust on it and gently blow it in the wind. And then find someone who needs a little kindness dust spread to them and you be the one. Spread some dandelion dust for the good of the world! This entry was posted in devotional, inspirational, motivational, spiritual on April 18, 2017 by Deanna Young.